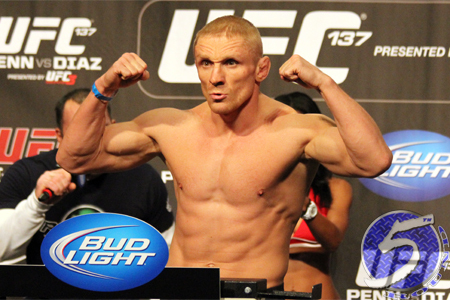 The Nevada State Athletic Commission revealed Saturday UFC featherweight Dennis Siver (pictured) tested for hCG (Human Chorionic Gonadrotropin) following December’s unanimous decision victory over Manny Gamburyan at UFC 168. FoxSports.com’s Mike Chiappetta confirmed Siver’s flunked screening with NSAC chairman Francisco Aguilar. Whatever the reason Siver used the substance, or whatever the 35-year-old wants to claim he used it for, it is banned by the NSAC. Siver is facing a suspension and fine. In addition, Siver’s win will most likely be overturned to a no contest. Earlier this month, the NSAC reported all 22 fighters who competed in the December 28 event were drug tested. Everyone passed on their first attempt, but Siver and Siyar Bahadurzada produced “inconclusive” results and needed to have their B-samples examined. Aguilar confirmed Bahadurzada’s B-sample returned negative.